Grateful Dead was an American rock band formed in 1965, in the San Francisco Bay Area. It was known for its unique and eclectic style, which fused elements of rock, folk, bluegrass, blues, reggae, country, jazz, psychedelic rock, and gospel—and for live performances of long musical improvisation. Members of Grateful Dead are regarded as the grandfathers of the jam band music style. Fans of the Grateful Dead were known as "Deadheads" and were renowned for their dedication to the band's music. Some followed the band from concert to concert for years, creating a unique and tolerated parking lot scene for each concert event. As "the Dead" and its sound matured over 30 years of touring and recording, each member's stylistic contribution became more identifiable, especially guitarist Jerry Garcia, the band's de facto leader, although he refused the role officially. As a highly successful, self-sustaining touring rock band, the Grateful Dead established an approach to their craft outside the standard music-industry business model. This included letting their fans record their concerts. In the mid 1980s, twenty years into their "long strange trip" the band began selling tickets privately to their fan base in advance and for a reduced cost under the venue's and ticket merchant prices. A small number of these tickets for each event were identified as taper tickets, allowing the owner to bring in personal sound recording equipment. Their emphasis on touring and creating a sense of community centered on their concepts made the "Dead" the most viewed rock band in its time. The Grateful Dead were inducted into the Rock and Roll Hall of Fame in 1994. In 2007, the group received a Grammy Lifetime Achievement Award. The Grateful Dead began its career in Menlo Park, California, playing live shows at Kepler's Books. The group originally took The Warlocks in April, 1964 and emerged from from the remnants of a Palo Alto jug band called Mother McCree's Uptown Jug Champions. Soon after they moved to the Haight-Ashbury section of San Francisco, joining groups as the Jefferson Airplane, Quicksilver Messenger Service, Big Brother & the Holding Company, and Santana in the city that was quickly becoming known as the epi-center of the hippie counterculture movement. The founding members of the band were: Guitar and banjo player Jerry Garcia, guitarist Bob Weir, organist Ron "Pigpen" McKernan, bassist Phil Lesh, and jazz drummer Bill Kreutzmann. In early December 1965, the group changed its name to Grateful Dead when it was discovered that another band was already recording under the "Warlocks" name. The name Grateful Dead was chosen from a dictionary: "The soul of a dead person, or his angel, showing gratitude to someone who, as an act of charity, arranged their burial." The term "Grateful Dead" also appears in folktales of a variety of cultures. The Grateful Dead's musical influences varied widely, including blues, rock and roll, country music, bluegrass, country-rock, and jazz. These various influences were distilled into a diverse and psychedelic whole that made the Grateful Dead "the pioneering Godfathers of the jam band world." The Grateful Dead formed during the era when bands like The Beatles and The Rolling Stones were dominating the airwaves and folk star Bob Dylan had recently released records featuring electric instrumentation. Grateful Dead members have stated that it was after attending a concert by the New York City "folk-rock" band The Lovin' Spoonful that they decided to "go electric" and look for a "dirtier" sound. The new "Dead" music, however, was also very different from bands like Dylan's or the Spoonful, partly due to the classical training of band member Phil Lesh. Lesh came out of a formal classical and electronic music background, while organist Ron "Pigpen" McKernan was a no-nonsense blues lover, and drummer Bill Kreutzmann had a jazz and R&B background. Their first LP (The Grateful Dead, Warner Brothers, 1967), was released in the same year that Pink Floyd released Piper at the Gates of Dawn, Jefferson Airplane released Surrealistic Pillow, and the Beatles released Sgt. Pepper's Lonely Hearts Club Band. The Grateful Dead’s early music was part of the process of defining the "psychedelic music" genre. They developed their "psychedelic" orientation out of meeting Ken Kesey in Palo Alto, California and subsequently becoming the house band to the Acid Tests he staged. After relocating to the Haight-Ashbury section of San Francisco, their "street party" music tradition developed out of the many psychedelic dances, "love-ins," open-air park events, and closed-street Haight-Ashbury block parties at which they played. The Dead were not inclined to fit their music to an established category such as pop rock, blues, folk rock, or country/western. Individual tunes within their repertoire could be identified under one of these stylistic labels, but overall their music drew on all of these genres and more, frequently melding several of them. Often, both in performance and on recording, the Dead left room for exploratory jams termed by their fanbase as "Space." Their early records reflected the Dead's live repertoire – lengthy instrumental jams with group improvisation, best exemplified by Dark Star. However, lacking the energy and audience interplay of their live shows, their early albums did not sell well. The 1969 live album, Live/Dead, captured more of the group's essence, but commercial success did not come until Workingman's Dead and American Beauty were released in 1970. These records largely featured the band's laid-back acoustic musicianship and more traditional song structures. 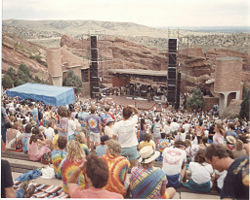 Deadheads await the start of a 1987 at the Red Rocks Amphitheater in Colorado. As the band, and its sound, matured over 30 years of touring, playing, and recording, each member's stylistic contribution became more defined, consistent, and identifiable. Lesh, who was originally trained as a classical trumpet player with an extensive background in music theory, did not tend to play traditional blues-based bass forms, but opted for more melodic and complex lines, often sounding like a second lead guitar. Weir, too, was not a traditional rhythm guitarist, but tended to play jazz-influenced, chordal inversions at the upper end of the Dead's sound. The two drummers, Mickey Hart, who joined the band in 1967, and Kreutzmann, developed a unique, complex interplay, balancing Kreutzmann's steady beat with Hart's interest in percussion styles outside the rock tradition. Hart often incorporated an 11-count measure to his drumming, bringing a new dimension to the band's sound that became an important part of its emerging style. Garcia's lead lines were fluid, supple, and spare, owing a great deal of their character to his training in fingerpicking and banjo. The band's primary lyricists, Robert Hunter and John Perry Barlow, wrote songs of love and loss, life and death, beauty and horror, gambling, murder, religious themes, traveling and touring. Less frequent ideas include the environment and other issues from the world of politics. The presence of these latter themes in Grateful Dead repertoire parallels that of keyboardist Brent Mydland's who joined the band from Bob Weir's Bobby and the Midnights in 1978, following the departure of pianist Keith Godchaux. 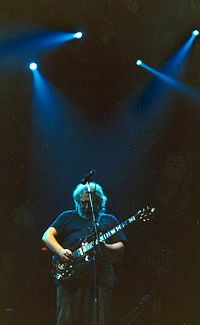 Jerry Garcia performing Stella Blue with Grateful Dead in the Philadelphia Spectrum, September 1987. Although he intensely disliked the appellation, and eschewed its attendant responsibility, Jerry Garcia was the band's de-facto musical leader and the source of its identity. In reality Grateful Dead existed as a community with each member having equal status. Garcia was an accomplished artist, author, multi-talented musician, as well as the lead guitarist. The band amplified not only music and Garcia’s eclectic musicianship, but also his tendency to good cheer and general goodwill, his intelligence, willingness to speak his mind, and libertarian attitude. He was an exemplar of the communitarian, drug-positive hippie sub-culture of San Francisco’s Haight-Ashbury district. Garcia was a charismatic, complex figure, simultaneously writing and playing music of enormous sensitivity and insight while leading a personal life that often consisted of self-destructive excess, including well-known drug addictions beginning in the late 1970s, and obesity. A self-described compulsive person, Garcia smoked several packs of cigarettes daily for decades. From the mid 1980s into the early 1990s his body weight soared to more than 300 pounds at times. He was known for generosity to the point of financial recklessness as indicated by the settlements he offered each of his three ex-wives. In July 1986, on an extremely hot day at an outdoor concert at RFK Memorial Stadium in Washington, D.C., Garcia suffered insulin shock and went into a diabetic coma. The coma lasted four days and when he came out of it, Garcia had forgotten among other things, how to play the guitar. His longtime friend David Grisman coached Garcia's return to mastery of the instrument. At the time Garcia's physician's reportedly gave him five years to live unless drastic lifestyle changes were made. Garcia also suffered for most of his life from sleep apnea. It was this ailment that is listed as his cause on death on August 9, 1995. The Grateful Dead toured steadily throughout their long career, usually three times annually; with spring, summer, and fall tours, playing more than 2300 live concerts. In the early Haight-Ashbury days, when they lived at 710 Ashbury Street in San Francisco, California, the band frequently dedicated its time and talents to their community, making available free food, lodging, music, and health care to all comers. In 1967, when the population influx tipped the environmental scales and the entire Haight-Asbury scene suffered a meltdown, the communitarian experiment was permanently compromised. In the early 1970's the band members left 710 Ashbury and moved north to Marin County, California. With the exception of 1975, when the band was on hiatus and played only four concerts, all in San Francisco, Grateful Dead performed many concerts every year, from their formation as the Warlocks in April 1965, until July 9, 1995. Initially, all their performances were in California, principally in the San Francisco Bay Area and in or near Los Angeles. Except for three nights at the end of July 1966 in Vancouver, British Columbia, they began touring nationally in June 1967. The band made a few detours to Canada, appearing at Expo '67 in Montreal on August 6, 1967 after a week-long run at the O'Keefe Center in Toronto. In 1970 they toured Canada from coast to coast traveling via the Trans Canadian Railroad, a trip documented by Garcia's song Might As Well and the movie Festival Express, released in 2006. Grateful Dead toured Europe four times, the most memorable tour coming in 1972 with 23 dates. They also performed across European continent with tours in 1974, 1981, and 1990. For three nights in September, 1978 they appeared in concert at the Giza Sound and Light Theater in the shadow of the Great Pyramid of Giza, Cairo, Egypt. They appeared at the Monterey Pop Festival in 1967, and at the Woodstock Music and Arts Festival in 1969. Their first performance outside North America was a single date at the Hollywood Music Festival held in Ashton-Under-Lynne, England on May 24, 1970. Their largest concert audience came in July, 1973 when they played, along with The Allman Brothers Band and The Band, before an estimated 600,000 people at the Summer Jam at Watkins Glen. Most of these concerts are preserved in the band's tape vault, and several dozen have since been released on CD and as downloads. Grateful Dead's mentality fostered a sense of community among fans, who became known first as Dead Freaks then Deadheads; many of whom followed the band's tours for months or years on end creating a festival scene at each venue. 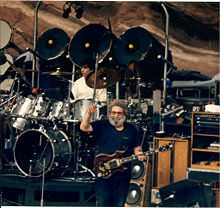 Following Garcia's death in August 1995, the remaining members of the Dead formally decided to disband. The main focus of the members was to pursue various solo projects, most notably Bob Weir's Ratdog, Phil Lesh and Friends, and various projects by Mickey Hart, including music for the 1996 Olympics. In June 1996, Bob Weir (with Ratdog) and Mickey Hart (with Mickey Hart's Mystery Box), along with Bruce Hornsby and his band, joined five other bands and toured as the Furthur Festival. In 1998's Furthur Festival, Weir, Hart, and Bruce Hornsby were joined by Phil Lesh to form a new band called The Other Ones. 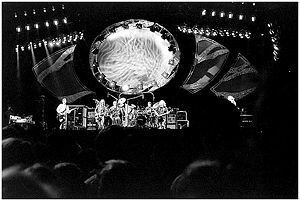 The Strange Remain is a live recording of The Other Ones during the 1998 Furthur Festival. The lineup of The Other Ones would shift, notably involving the addition of Bill Kreutzmann, the departure, then return, of Lesh, and the departure of Bruce Hornsby to pursue his solo work; however, the band settled on a steady lineup by 2002. The tour of The Other Ones, in 2002, began with two huge shows at celebrated Alpine Valley and continued with a late October return to Shoreline Amphitheatre and an ensuing full Autumn and Winter tour culminating in a New Years Eve show in Oakland where the band played Dark Star among other fan favorites. The members would continue to tour on and off through the end of their 2004 Summer Tour—the "Wave That Flag" tour, named after the original 1973 uptempo version of the song "U.S. Blues." The band accepted Jeff Chimenti on keyboards, Jimmy Herring on guitar, and Warren Haynes on guitar and vocals for the tour. Members of the Dead still actively tour with their own bands—Bob Weir and Ratdog, Phil Lesh and Friends, the Mickey Hart Band, and Donna Jean and the Tricksters. 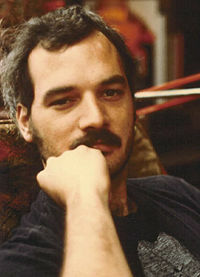 Bill Kreutzmann toured the eastern U.S. in 2008, with Oteil Burbridge and Scott Murawski, and Tom Constanten often sits in with various bands. On February 4, 2008, Mickey Hart, Phil Lesh, and Bob Weir, joined by Jackie Greene, John Molo, and Steve Molitz, performed a show entitled "Deadheads for Obama" at the Warfield Theater in San Francisco, in support of Democratic presidential candidate Barack Obama. Grateful Dead lived at the edge of the "official music industry" developing a business model that was antithetical to the idea of creating a polished album and then touring to support its sales. The model they evolved was based on touring as an end in itself, rather than as a means to promoting a studio album. Their tours included playing multi-night runs at large arenas and stadiums from year to year. Their shows, usually longer than two hours, and sometimes much longer, rarely featured the same song twice in succeeding nights and never played the songs in exactly the same way. These unique qualities made the Grateful Dead the most viewed rock band in its time. It spawned a faithful following of Deadheads that came from all parts of society, many of whom went on to become influential artists themselves. The band also condoned the live taping of its shows which spread the Dead's music "virally" long before the idea of viral marketing was formally conceived. The Dead thus proved that a touring rock band could be successful and self-sustaining outside of the standard music-industry business model. In 2004, Rolling Stone ranked the Grateful Dead number 55 on its list of the 100 Greatest Artists of All Time. On February 10, 2007, the Dead received a Grammy Lifetime Achievement Award. The award was accepted on behalf of the band by percussionist, Mickey Hart and drummer, Bill Kreutzmann. The legacy of Grateful Dead can be summed up by the numbers; 36,086 songs performed at 2,317 concerts in 298 cities, over a period of 30 years, with 11 members, all by one band. "Truckin' / Sugar Magnolia," 1974? Blakesberg, Jay, and Jackson, Blair. Between the Dark and Light: The Grateful Dead. San Francisco: Backbeat Books, 2002. ISBN 978-0879307233. Dodd, David G., and Spaulding, Diana. The Grateful Dead Reader. New York: Oxford University Press, 2000. ISBN 978-0195124705. Gans, David, and Simon, Peter. Playing in the Band: An Oral and Visual Portrait of the Grateful Dead. New York: St. Martin's Press, 1985. ISBN 978-0312616304. All links retrieved July 11, 2017. This page was last modified on 14 August 2018, at 19:44.